Iona "I-401, The Blue Steel"
Iona is the Mental Model of the Fog Ship: I-401 submarine. After the great battle, she was placed on stasis and given order to follow and obey to Chigaya Gounzo. She's one of the oldest Mental Models in existence and, having spent around two years with humans, she is one of the most versed in the human way of life. Unless she reveals her abilities, it is practically impossible to distinguish her from a normal human. 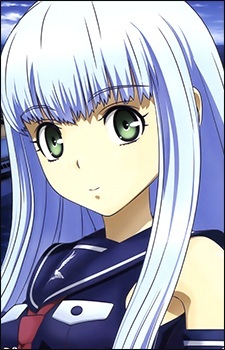 Iona is usually calm and rather quiet; she's helpful towards her crew and is a dear friend of Gunzou. She doesn't like taking big risks, but often agrees that Gunzou's sometimes rather crazy plans are the best ones. Iona appears to be sharing various duties like cleaning and cooking with her crew. It doesn't look like she has any definite hobbies, but she likes watching anime as shown in the manga.